Following instructions from our clients, D B Multitrade Ltd our Property Care Association (PCA) qualified damp and timber surveyor attended a detached house in Kenilworth Road, Balham to identify considerable amounts of damp affecting the internal wall surfaces. The external wall surfaces were rendered. This was randomly tested by tapping with a hammer which revealed a hollow sound, indicating that it had lost its key and allowing rain to be trapped and penetrate the 225mm solid brick walls. During the winter, the trapped water can freeze and expand, forcing even more rendering away from the walls. Random moisture readings were then taken to the internal wall surface which also identified rising damp to other walls. 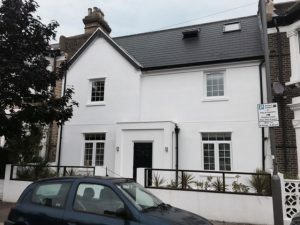 In our surveyors opinion various walls of the property required a new damp proof course and the external rendering of the front elevation needed to be removed and re-rendered. Our detailed report was sent to our clients for their approval. On acceptance of our clients instructions our experienced operatives attended the property and proceeded to remove all of the damp and contaminated wall plaster and carefully disposing of it.A pattern of holes were drilled, horizontally, into a chosen line of mortar, cleared of dust and injected with a Silane/Siloxane cream damp proof course at the approved rates. The walls were then prepared and replastered in accordance with our damp proofing specification to complete the system. Suitable safe scaffolding was erected to gain complete access to the defective rendering, which was removed and disposed of. The walls were then rendered using two gauged water proof coats of sand and cement, incorporating a water proof solution, which was troweled to a smooth finish. The scaffolding was removed and all was left tidy for our clients to decorate. Damp proofing to prevent rising damp and external rendering to prevent rain penetration are covered by or 20 Year Guarantee, which is also protected by Guarantee Protection Insurance (GPI). Using an established company such as Tapco HomeDry our clients were confident that the advice and work we carried out will keep the house dry for many years to come, so like them, do it once, do it right. call us first.